the artists featured here have all collaborated with or performed with or supported vox vespertinus artistically, personally and in ways words can't properly express. every person and group on this page is immensely innovative and gifted, and the world is better for their constant striving and unique artistic expression. beautifully shocking butoh dance and performance artist. learn more about her here. masterful classical and experimental violinist. mad scientist of industrial and atmospheric noise. find his music here. gorgeous dark guitars. of legion within fame. find his music here. stratoshperic classical-experimental cellist. find his music here. a captivating, sensual and mystical troupe of movement artists who fuse eastern belly dance, modern dance, butoh and ritual to gorgeous affect. sensual modern classical vocalist. find her music here. most excellente from-the-shadowlands composer, guitarist, vocalist, sound engineer. find his music here. insanely talented world music composer and multi-instrumentalist. the only person on the planet who can play a Fender Stratocaster electric guitar and Gu Zheng (Chinese Harp or Zither) simultaneously. find his music here. incomparable electronic-world music multi-instrumentalist, vocalist, tuvan throat singer. find his music here. inspired and inspiring improvisational bass, electronic percussion + noise. learn more about him here. consortium supporting a wide range of adventurous music and sound art through recordings, performances, and exhibitions since 1989. learn more here. legendary musician, composer, writer. of bauhaus, tones on tale, love and rockets fame, and more. 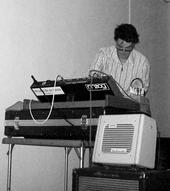 transcendent electronic composer and noise artist. find his music here. musician and ritual artist whose unique vision has evolved to draw equally from performance and musical traditions both modern and ancient–raga, shamanism, the revisionist arts of electroacoustics, noise, butoh, and free improvisation. learn more here. experimental classical electronic ensemble. find their music here. mind blowing ambient-industrial-experimental artist. find his music here. revolutionary butoh performance troupe. vox has done performances with the gorgeous collective and astonishing individual dancers including: vanesssa skantze (see above), alex ruhe, briana jones. learn more about them here. pioneering ambient-experimental improvisational guitarist. find his music here. this amazing videographer, visual artist and vj augments musical and performance art events with dramatic, spellbinding video projections. innovative choreographer and movement artist. we got a great review in the Seattle Times on our last performance. learn more about her work here. absolutely brilliant ambient soundscapes. find his music here. otherwordly percussionist and noise artist from japan. vox had the honor of opening for him at a recent seattle show. learn more about him here. dazzling performance troupe specializing in storytelling through trapeze, aerial dance, stiltwalking, fire performance, and character work. learn more about them here. commanding avante gard multi-instrumentalist and vocalist. find her music here. a unique festival celebrates new & experimental music in the pacific northwest of psychic, ecological, or otherwise deeply resonant importance. learn more here. exquisite experimental guitar + percussion. learn more about him here.